UNIQUE Point of Entry Firestop Sleeve System — for firestopping cables and weatherproofing cable feeds entering from outside a building and/or through a firewall. Order optional Roof Mount Rubber Boot on this page also. Made in the USA. 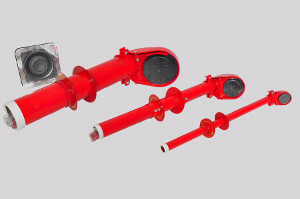 UNIQUE’s Point of Entry Firestop Sleeve System (POE) is designed to firestop cables and weatherproof cable feeds from satellites, cameras, pole lines or any other outside-fed communications cables. The can be used as a point-of-entry either through an outside wall or through a rooftop penetration. Point of Entry Firestop Sleeves are available in 1″, 2″, and 4″ diameters. Most point-of-entry penetrations will require a sleeve at least 24 inches long so we stock all three diameter sizes (1″, 2″, and 4″) in 24“ lengths. We also can manufacture and ship custom lengths with a 24 hour lead time. Components are manufactured of Electrical Metallic Tubing (EMT) and powder coated red in our USA factory. When installing the Point of Entry Firestop Sleeve System on a rooftop, you may also want to order the optional Roof Mount Rubber Boot, which is staggered to seal and weatherproof all 3 diameter sizes of the Point of Entry Firestop Sleeves. For special sizes, call Customer Service at 251.960.5018. Silicone material for hot pipes, chimney pipes, extreme environments and service. Flexible Base Design- Sealing tightly with sealant and almost any type of fastener, the flexible base is virtually compatible with any roofing material– metal, plastic, asphalt, tile, rubber membrane, and more. Resilient design- The Boot performance is unaffected by ice/snow, hail stones, vibration, or expansion/contraction. Environmental control- The Roof Mount Rubber Boot provides a permanent seal that controls gaseous or liquid environments to eliminate leakage and odor contamination. Corrosion-resistant base-The Roof Mount Boot base is made of heavy-duty aluminum alloy for flexibility and corrosion resistance. 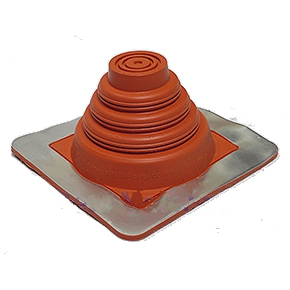 Roof pitch adaptability- The stepped cone design makes our Roof Mount Rubber Boot easily adaptable to most roof pitches.